Growth causes processes to burst at the seams. What used to work fine now causes bottlenecks because more and more decisions have to go through the business owner. If you don't change how you work, that growth is unsustainable and will only make thigns worse. The book covers everything you need to know to avoid mistakes business owners commonly make when growing their business. Businesses tend to grow naturally. But that growth can be dangerous, especially if you've never grown a business before. There are a lot of things that can go wrong. Growth means more work and more people working for you. But things break when you grow. Before you know it, you will lose control, expenses will eat up all the profit, your product/service won't be up to the standard anymore, you'll be drowning in emails, and you won't know where your head's at any more. It will all culminate with you lying awake at the middle of the night as you wrestle with the thought of shutting it all down. 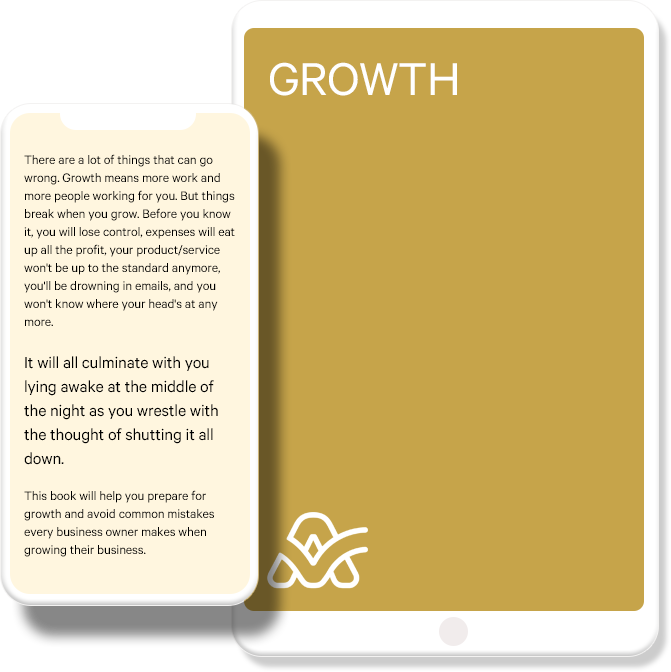 This book will help you prepare for growth and avoid common mistakes every business owner makes when growing their business. 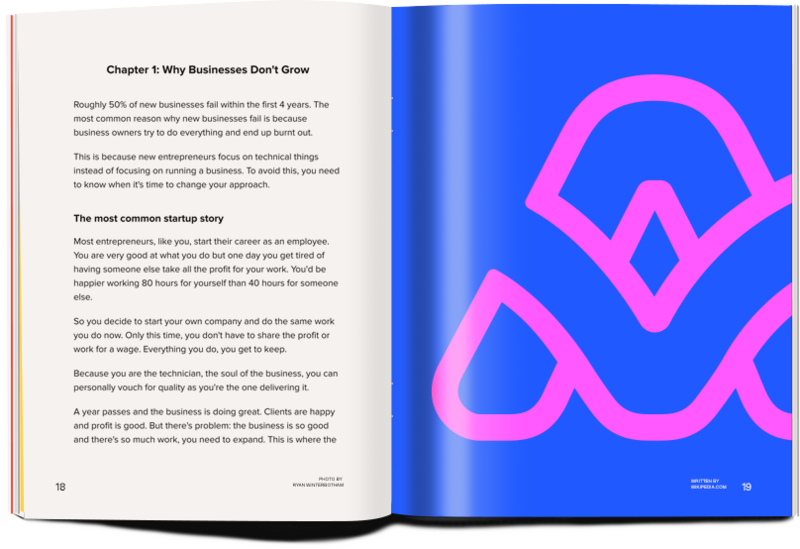 The book covers everything you need to know before you can grow your business. It will show you how companies grow and how each change impacts the way you have to run your business. You will learn about important topics, like: Founder's Trap, Leadership Pipeline, Greiner's Growth Curve, systematic employee onboarding, talent management, processes, client profitability, and more. This book will change how you think about your business. It will give you the insight you need in order to be a truly successful entrepreneur. But most importantly, it will help you sleep peacefully, knowing that everything is going according to the plan. Each growth stage is unique and brings its own set of challenges you need to accomplish in order to level up. Before you hire anyone, you first need to have a clear vision of how your business will function in the future. Once you know that, you can shape your processes and business according to that vision. Then, you should work on removing yourself from everyday processes so you can work on on the long-term market position. Start documenting processes in the form of standards, manuals, procedures, and onboardings so you don't have to hold each employee's hand. Once your employees have clear guidelines, they can work on their own and make minute decisions without you. Somewhere along the way (>10 employees), you'll hire your first project manager or HR manager. They will lift a huge burden of you back. Because you'll depend on them a lot, you’ll need a risk plan in case they leave and develop your leadership pipeline. No matter how good your processes or management are, talented people are at the core of your business. They are the backbone and the engine behind your growth. Very few businesses can get away with low-skilled labour, especially in the 21st century and the rise of knowledge workers and automation. So learn how to recognize and nurture talent, and it will bring you lots of money. In the end, always keep in mind the three P's of successful businesses: philosophy, processes, and people. If you can align all three, only the sky's the limit to how much you can grow. This book is mainly for entrepreneurs who want to grow their business. But don't feel like you have to grow your company just because everyone says you should. Growth completely changes how you do business and once you grow, there's no going back. Your life will change, and not necessarily for the better. It all depends on your personality and what you want in life. There's nothing wrong with staying small. In fact, you'll probably feel much happier and more fullfilled. But if you feel the insatiable hunger and ambition, go for it.